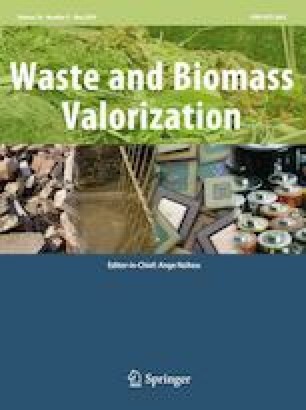 The effects of leachate spraying intensity (LSI, the ratio of leachate spraying rate and spraying area) on high-solid anaerobic digestion (HS-AD) of corn stover (CS) and organic fraction of municipal solid waste (OFMSW) were investigated for the first time. Three leach-bed reactors (LBR) with working volume of 48 L were used in this study. Gaseous parameters including CH4, H2 and CO2 concentration, and liquid parameters including pH, volatile fatty acid (VFA) and total inorganic carbon (TIC), were measured. Results found that LSI could significant influence the methane yield from HS-AD of CS and OFMSW. Higher LSI of 88 mL/min dm2 could enhance the degradation rate of feedstocks, with highest VFA concentration of 21273 mg/L using liquid sludge as inoculum. Consequently, the methanogenesis was inhibited. Incubation of solid digestate (50% of solid digestate + 50 of liquid sludge) can be operated stably at higher LSI of 88 mL/min dm2, where highest methane yield of 184.6 mL/g VS was obtained. The finding of this study could provide useful information for the efficient operation of HS-AD. This work was supported by the National Natural Science Foundation of China (No. 51508572).